The Caribbean island of Jamaica is to have a female prime minister for the first time. 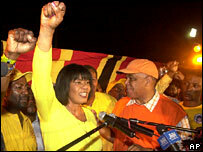 Portia Simpson Miller, 60, was elected president of the governing People's National Party in an internal vote. She will automatically become prime minister when the incumbent, PJ Patterson, steps down in the next few weeks after 14 years in the post. Mrs Simpson Miller, currently local government minister, narrowly beat the national security minister to the job. Dr Peter Phillips had been seen as the favourite to succeed Mr Patterson but his record on tackling violence has been questioned. There have been more than 4,000 cases of homicide in Jamaica since he took charge of security five years ago. Mrs Simpson Miller, who has been a popular figure in Jamaican politics since the 1970s, took 1,775 votes to 1,538 votes for Dr Phillips in the leadership vote. Speaking in Kingston as the results were announced, she said: "I accept your mandate... and pledge to honour my commitment to serve you all." Political opponents argue Mrs Simpson Miller does not have the skills needed to run the country. But commentators say the 60-year-old has gained strong popular appeal during her decades in politics. "She is seen as someone who has really risen through the ranks of the party, coming from a very, very poor section of Jamaica... to the top post," Radio Jamaica's Kathy Barrett told the BBC. "She's a woman who's very determined, a firebrand type of politician who has really hit home when it comes to the majority of people - especially women, the poor and the unemployed." Mrs Simpson Miller is expected to have taken over from Mr Patterson, Jamaica's longest-serving prime minister, by April. Before the leadership vote, Mr Patterson urged the party "to come together as one single family". He has led his party to three election victories but his government faces criticism over rising crime and has been dogged by charges of corruption. The next parliamentary elections are due to take place in 2007.